Reinvigorating days in the outdoors for your team, clients or suppliers. 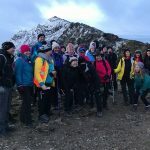 We are here to help you create your perfect outdoor adventure, challenge or team building event and design our packages to your specification, whether its for skills development, creativity or just a chance to get to know each other better. Your tailored adventure can take part over one or a few days and we can include (or advise on) transport, accommodation and meals as required. The outdoors provides the perfect environment for planned and unplanned personal development opportunities. By working as a team in a new and inspiring environment team members have opportunities to improve team working and communication skills. By experiencing a sense of accomplishment together team members return to the organisation reinvigorated resulting in improved morale and productivity. Organisations develop great relationships with Charities for mutual benefit and we work with organisations who want to hold fundraising events for their chosen charity. If you are thinking of organising a fundraising challenge then you might find our Charity Challenges page useful. We can also liaise with your chosen charity for you if you need us to.